Square vessel sinks are popular these days because their open box shape is classic and neutral. Whether the sides are minimalist-approved zero-radius, or slightly rounded, square vessel sinks look great in a wide variety of bathroom styles — from industrial to cottage. 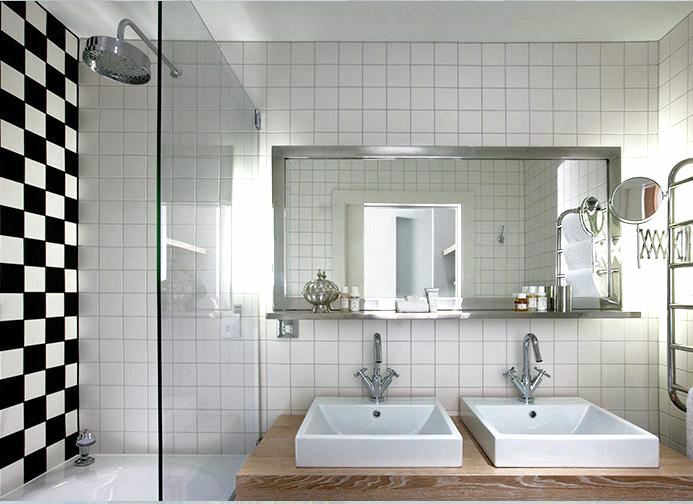 A square vessel can sit on any type of surface from a conventional vanity to a tiled ledge. Space behind the sink is a non-issue in tight bathroom spaces because wall-mounted faucets are part of the drill. Many years ago I left the choice of a bathroom sink to our architect and wound up with a small, low, under mounted sink that I absolutely hated from day one. I would have been much happier with a vessel sink mounted on top, since the height is adjustable for maximum comfort. Today, most vessel sinks are made of vitreous china, which is a ceramic or porcelain sink with a durable enamel coating applied after the ceramics are fired, or cooked. The coating makes the sink body tougher, denser, waterproof and gives it a high sheen. Vitreous china products are commonly used for all types of sanitary ware — sinks and toilets especially. 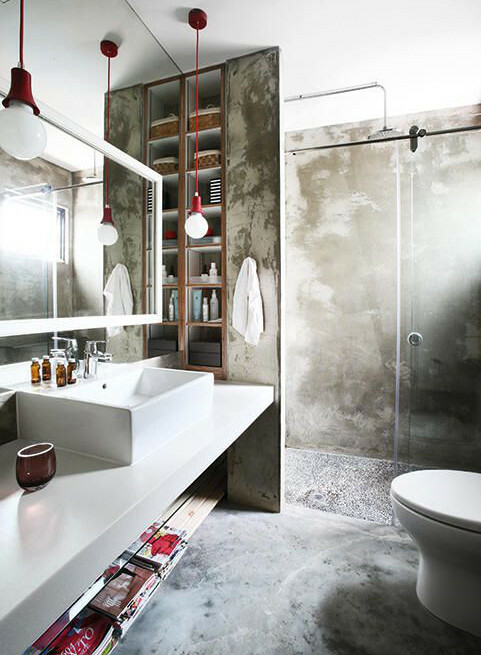 California designer Antonio Martins has a way with repurposing industrial pieces in bathrooms [top]. For this wine country home powder room, he went with a beefy industrial based topped by a thick Carrara slab. 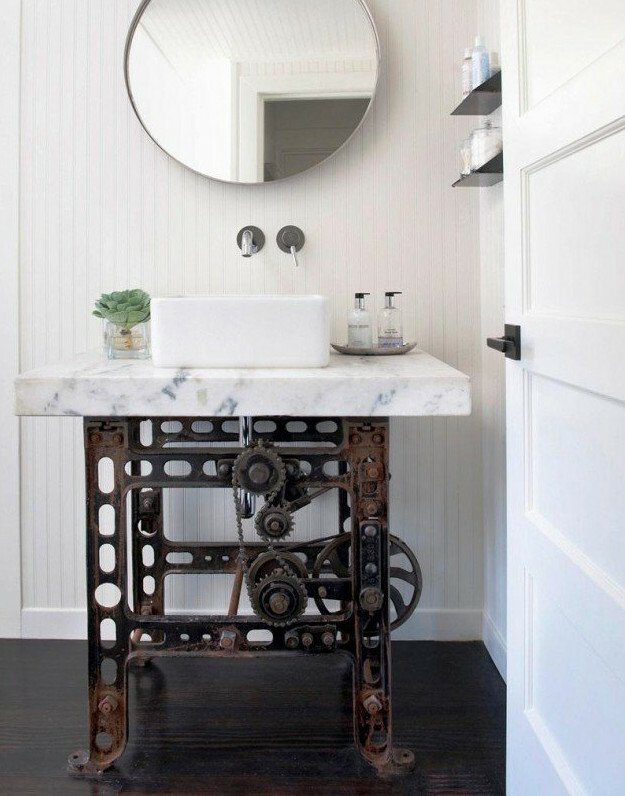 I would like a larger basin given the heft of the wonderfully rusty piece of machinery — with gears in a spot to conveniently conceal the sink drain pipe. However, the modern spout with wand control is right in step with the aesthetic and it’s all softened by the cottage style bead board for a stunning, one-off result. 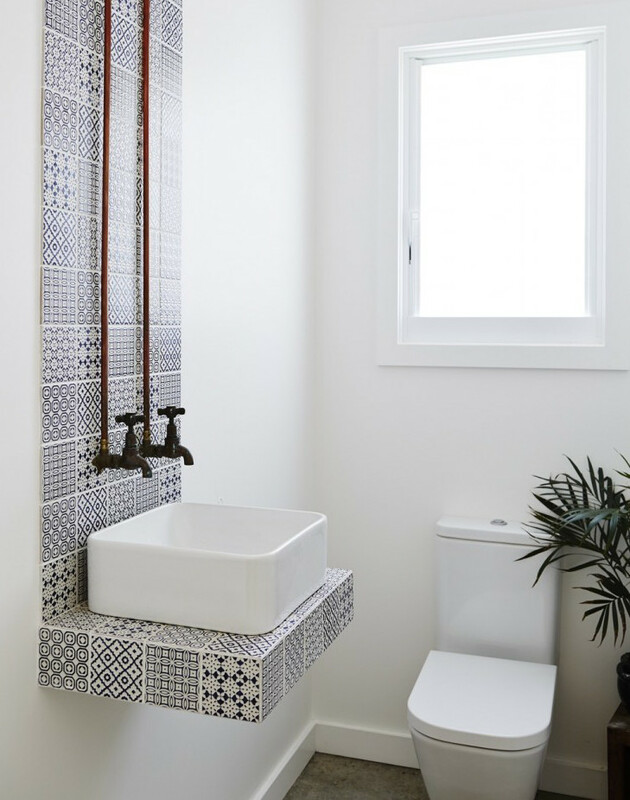 A similar small square vessel looks perfect on this tiny cantilevered ledge in a boy’s half bath because it’s so cleverly framed by the indigo-and white patterned tile. The narrow backsplash is unusual for a bathroom but makes sense as a backdrop for exposed copper hot and cold water pipes that terminate in a set of wall-mounted, wheel handle taps. No visible support for the sink platform and no visible drain beg some plumbing questions. But using the vessel sink like an old-fashioned washstand bowl makes perfect sense for a small, utilitarian bath. This may be my favorite square vessel sink of the group because it’s old, it’s odd and large. If I was switching out my bath, I’d look for one like this as I especially like the off-white warmth of fireclay — another durable clay used for sanitaryware that withstands firing temperatures up to 2000 degrees F. Shaw’s has made fireclay sinks a trademark for kitchens. 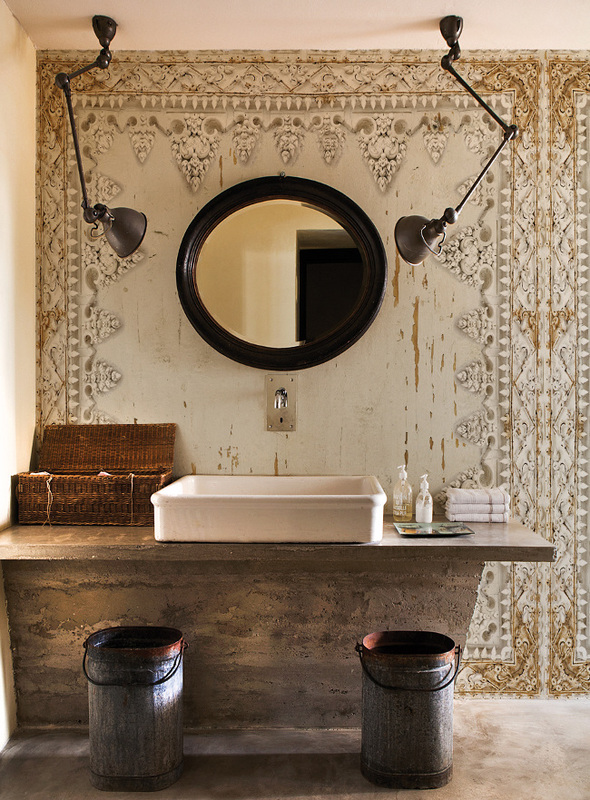 Set on a rustic concrete base, and paired with a modern faucet spout, this fireclay beauty coordinates with the Indian inspired wall covering. Talk about an aura. 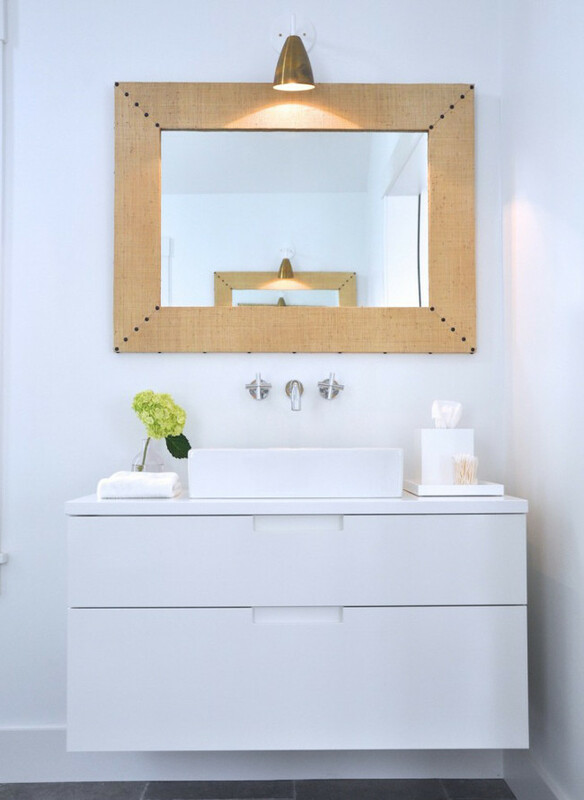 Clean and minimalistic this sink feels modern, simple and almost Zen on a floating, wall-hung vanity. Given the relatively shallow basin and splashing that can occur with a wall-mounted faucet (Kohler’s Purist with cross handles) it’s a surprise not to see tile on the wall. But that would create a very different look and paint is cheap. It’s unusual to see square vessel sinks caulked on the bottom as this one is. It’s also set flat back against the mirrored backsplash. The difference here is that the sink has an integral ledge for a deck-mounted faucet so the integration looks fine. Vessels in this style are usually paired with short faucets to keep splashing at a minimum. However, the integral deck does subtract inches from the basin itself. A pair of small square sinks, also with integral faucet decks, can be set rather close together as this London hotel bath proves. While the profiles are square, the bowls have graceful curves which is a nice feature when the sinks are shallow. The lab-style faucet add the hint of a medical look which is accentuated by the stainless mirror. In contrast, there’s the natural wood vanity top — it’s a hotel not a doc’s office. Tile used behind the sinks covers the entire wall over and into the shower area to keep the busy wall looking neat — especially with twin vessels as the focal point. No one hesitates to take bathroom inspiration from hotels today and this bath has many talking points. (Source: antoniomartins.com, remodelista, interiorsupply.co.uk, remodelista, pinterest, paul raeside). You also might like Whimsical Green Bathrooms and Modern Powder Room Sinks.